The Rose CrystalView USB2 CRK-2VH4U2TP-150 Video and USB extender extends dual video and USB devices up to 150 feet from the controlling computer. 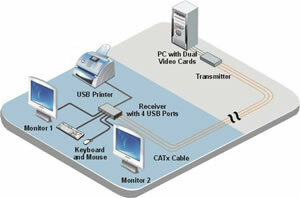 The CrystalView USB2 extender makes this possible by the use of standard CATx cable. You can view dual video and fully operate and control your USB devices from as far away as 150 feet using standard CATx cable. Remotely accessing your USB devices is made convenient in a variety of situations. You can locate users away from hazardous industrial environments where the USB device is located, locate devices away from areas vulnerable to theft of hardware and data, reduce noise and heat; increase desk and floor space. 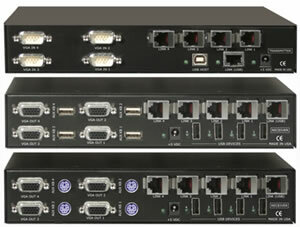 Transmit high quality dual video using CATx cable. Cable length is no problem. The CrystalView USB2 automatically adjusts the video compensation and gain based on the cable length. The auto skew model automatically adjusts the RGB video components to provide a crystal clear display regardless of cable type, patch panels or cable routing. Locate a video monitor(s) in remote control areas, classrooms, conference areas, video studios, and present the video from a computer 150 feet away.